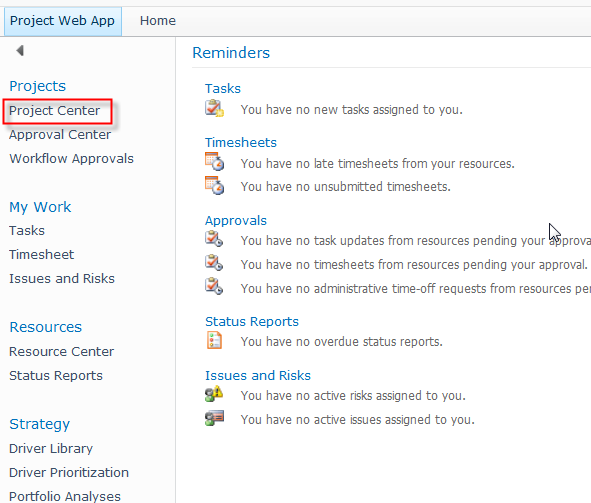 ← How to Create Enterprise Calendars in MS PROJECT SERVER 2010! 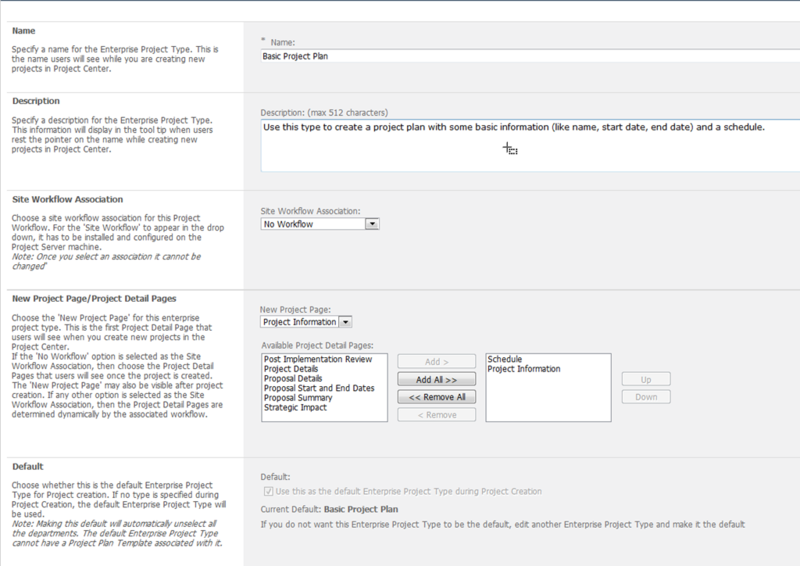 One of the greatest new feature in MS PROJECT SERVER 2010 is that you can create different project types. In previous versions that was impossible, so it was only one Template for all projects. As we all know, you can not use same template for ERP projects, Constructional Project, Pharmaceutical Projects, etc. OK! How can we create new Project Type? As you can see there are two built Project Types. 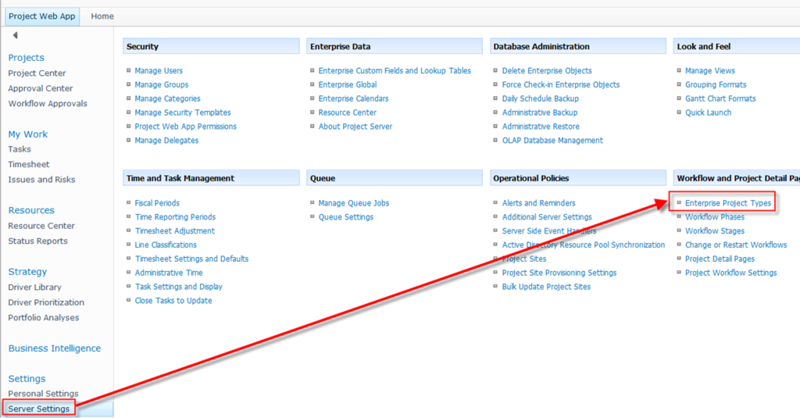 Because I am a very lazy person, I will use a Basic Project Plan to show you this functionality, instead of building my own Project type, which can be done if you click on New Enterprise Project Type, shown on the picture above! New Project Page: If you select No Workflow then here you choose which Project Page will be the first one when you create, or open you Project, and Available Project Detail Pages are pages that you want to include to your Project type! You must choose at least one Project Detail Page! Default: If you want this Project Type to be default, choose this option. Departments: If you choose Department then this project will be available to the users that belong to this department (or departments if you chose more than one)! Notice, that it is impossible to choose Department for Default Project Type, because default Project Type must be available to anyone, no matter which department that user belongs.Image: Put the specific image link for your Project type if you want! Order: Here you can put where do you want that your Project type appears in PWA! I’ll show you the example. 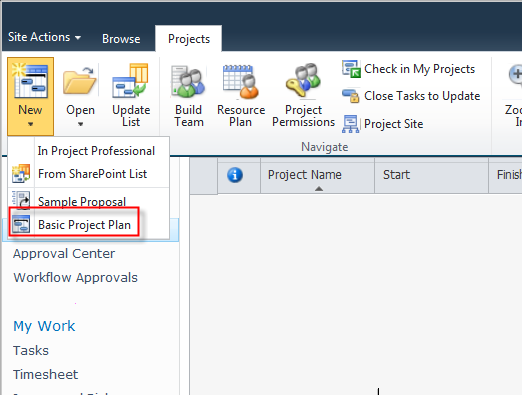 Project Plan Template: If you create specific Project Plan template for one or more Project type (creating templates is subject of some of my next Posts) you can assign them to the Project Type here. 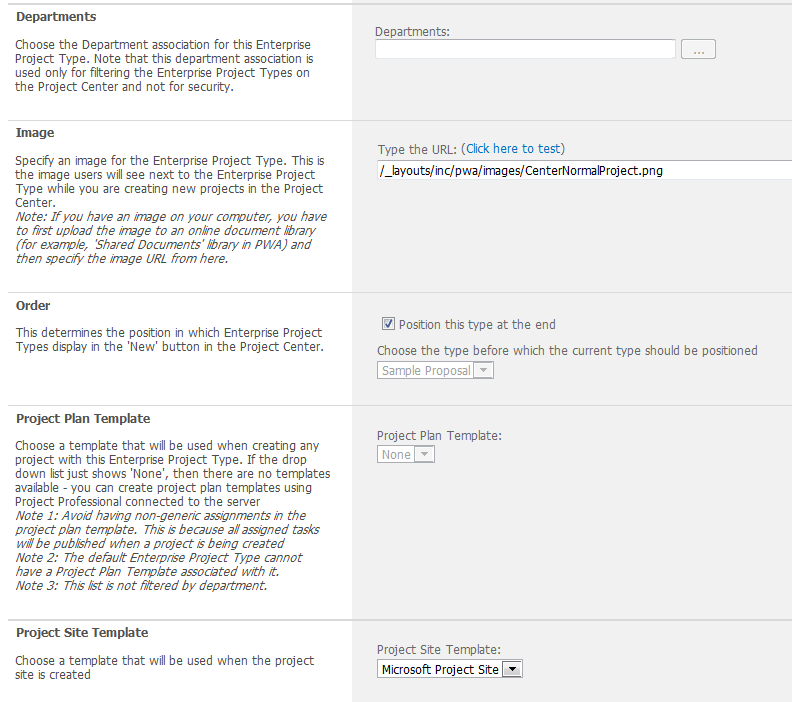 Notice, that it is impossible to choose Project Plan Template for Default Project Type. OK! 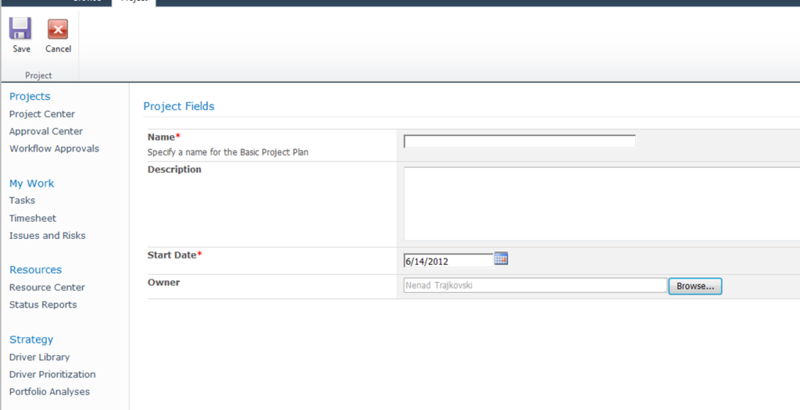 Where can you see this Basic Project Plan Project type? I have two detailed pages, as they were defined: Schedule and Project information! See the third picture from the top! This entry was posted in MICROSOFT PROJECT, Microsoft PRoject 2010, Microsoft Project Server 2010, MS PROJECT 2010, PMI, PRoject Management and tagged Microsoft Project 2010, Microsoft Project Server 2010, Microsoft Project Server 2010 - Enterprise Project Types, MS PROJECT. Bookmark the permalink. Excellent Nenad. Great job. I have been going all your blogs related to project, Fantastic. HEllo Nenad! I would like to say that your posts are very usefull and handy. I have a question: if we already have projects saved and published in our PS how can we insert/add project type in them? OK, Thanks a lot for your VERY quick response. So, your email is nenadtrajk@gmail.com? I’ll send you the file your via email. I have some question with attachment file but I don’t know how to enclosed the file here. Could you please give me your e-mail address? nenadtrajk@gmail.com I’ll be in my office at Monday 01.07.2012, and I sill se what I can do! Please give me as much details as you can!